With summer just around the corner my thoughts turn to one of one of life’s simplest pleasures: alfresco dining. Somehow even quite modest food and wines are transformed by a little sunshine and a cool breeze. These are occasions for clean, fruity white wines served well chilled with salads and cold meats, or for soft, low tannin reds to drink with the barbecue or wash down a bowl of pasta. This month’s whites all hail from cool, northerly regions. In wine-making terms they don’t come much more northerly than England. Vines have been grown in England since mediaeval times, but only recently have wines of real quality started to appear. Look out for excellent sparkling wines too since the climate and chalky soil of Kent are identical to those of Champagne. The wines of Alsace and Germany have much in common – grape varieties, absence of oak, tall flute bottles – but there are crucial differences. Most significantly, Alsace is part of France and its wines are made in the French style: dry, full-bodied, with plenty of alcohol. German wines tend towards low alcohol, light body and a balance of sweetness and acidity. By contrast, this month’s reds are southern – very southern in the case of the two Australian examples, and one from the sun-drenched South of France. This is a sensationally good English wine at a bargain price. With grassy, pear-drop aromas and a palate of ripe pear and lemony fruit it is delicate, delicious with fine balance and length. For £1 more, Majestic also has Pilton Manor’s excellent 1995 Fumé. Aged in oak barrels, it has a Burgundian roundness and savoury character. 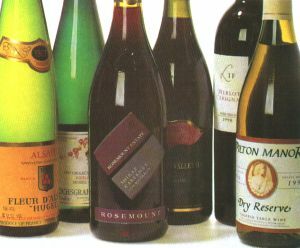 Unlike much of France, Alsace had a truly excellent vintage in 1997. The top house of Hugel has crafted a vibrant white, full-bodied wine, crammed with quince, peach and pear fruit and lingering, tangy acidity. Just delicious. Don’t be put off by the impenetrable label and memories of sugar-water plonk. The noble Riesling grape in Germany produces wines that are a million miles removed from cheap Liebfraumilch, striking a breathtaking balance between fruit, sweetness and acidity. This fine example has a beautifully delicate, waxy, flower and lime nose and gorgeous peachy fruit. It will gain aromatics and complexity given several years cellaring. This French wine has black fruit on the nose and quite a serious, structured palate. There is plummy depth and some bitter-sweet cherry fruit before a warm, spicy finish. Rosemount is a very reliable Australian brand. This has vivid forest fruit aromas suffused with pure blackcurrant. The palate has a liquorice depth and a deliciously creamy, almost toffee-like texture. Sweet black-fruit nose with some vegetal, cabbagey aromas and a tarry edge. The palate has blackcurrant and cherry fruit and an intriguing, earthy depth. There is sufficient tannin to suggest this one has cellaring potential too.